When the mix is ready separate it into equal parts in three bowls. Each bowl is for a specific color: light pink, hot pink and white. To achieve the light pink add a drop of food coloring to one bowl and stir until the dough becomes a light pink color. To achieve the hot pink add 3-4 drops of electric pink coloring to another bowl and repeat the process. Now that you have your three colors, grease a baking dish and patiently add irregular table-spoons of different colors until you fill the mold completely. The way you add the mix doesn't to be perfect because the camouflage design is irregular anyway. Heat your oven to 350°F and bake the cake according to package directions. When it's ready, insert a toothpick to make sure it's ready; if the toothpick comes out clean, the cake is done. Let the cake to cool and once it's cold, cover the cake with the frosting. To give it a more attractive appearance, add one or two drops of pink food coloring to white frosting in a medium pot. Stir well with a spoon and paint the cake with brushstrokes. Finally, sprinkle bright white pow-der on the cake. You can use the birthday girl's favorite color instead of pink. Don't add too much food coloring because it will give the cake a bitter taste. Here in the United States some families, like mine, celebrate Quince parties as well as celebrate Sweet Sixteen's. This is why it's always useful to have a few Sweet Sixteen recipes at hand that are simple and inexpensive. Today I want to share with you a cake recipe made with Pillsbury™ products; it's quite simple and perfect to celebrate a Quinceañera or Sweet Sixteen. 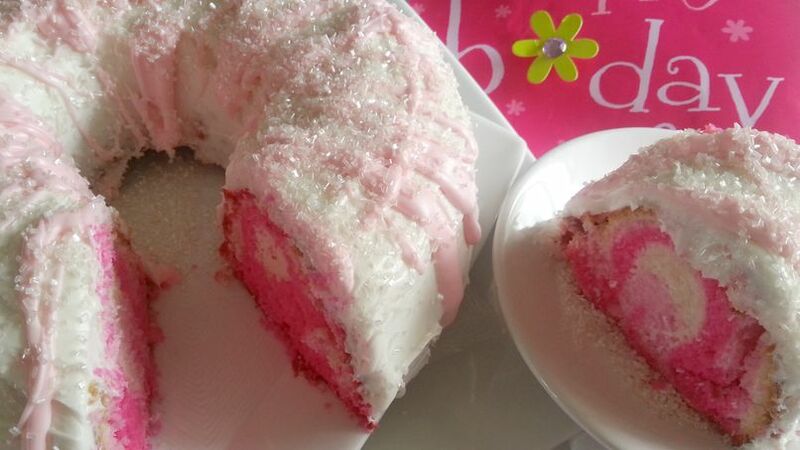 I invite you to prepare this pink camouflage cake with me, I'm sure it will be a great success!